Our memorable experience at the fine-dining Coriander Leaf on Christmas 2010 gave us great anticipation and excitement for their new casual outpost, Coriander Leaf Grill at Ann Siang. Other than that the price is more pocket-friendly here, this new joint focuses on Asian-inspired grilled meats using a charcoal grill or a tandoor. Chef-owner Samia Ahad, who founded Coriander Leaf in 2001, graduated from the prestigious Institute of Culinary Education in New York City and has experienced at Michelin-starred kitchens. It is quite unusual to have a female head chef, so it’s great to show our support. 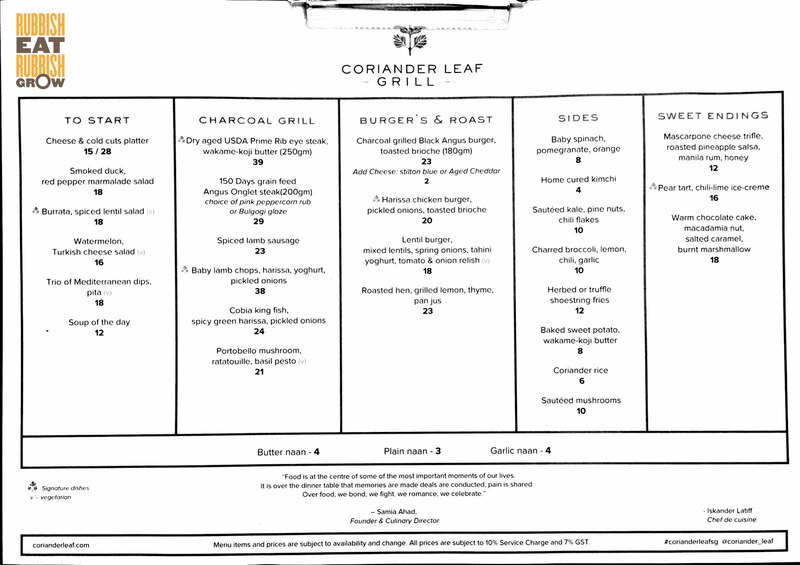 The menu at Coriander Leaf Grill is simple and easy. Almost every item, including the sauces, is made from scratch in-house. For starters, they recommend the trio Mediterranean dips with pita ($18), but since simple carbs are not fashionable anymore, so we went for the burrata ($18). It comes with spiced lentils, and although I don’t usually like the earthliness of lentils, this combination works excellently; a soft creamliness plays off a muskiness. The what-I-suppose-is pesto lifts the entire dish. The mains don’t come with sides; they are standalone meats. You’ll have to order the sides such as truffle fries ($12) or baked sweet potato ($10) separately. Actually, I would suggest to add some sides to the mains because it makes the plate fuller; looks better aesthetically; and fills up the stomach. We ordered all three of their signatures, and although they were very good, we all had a different favorite. The baby lamb chops, recommended medium, is marinated in harrisa, a North African chilli pepper paste. Not at all gamy, the chops have an appetizing sourness. Mr Fitness’s favorite, the tender char-grilled dry aged USDA Prime ribeye steak ($39), is topped with hand-churned wakame-koji butter. Wakame is a seaweed and koji is a living food made from the treatment of rice with a fungus called Aspergillus oryzae. In food science, seaweed gives the umami flavor, so does koji; so it’s no wonder that despite its simplicity, the steak is good. One of my grouse is that they use too much harrissa in their dishes that it is hard not to repeat orders with harrissa. However, my favorite is the harrisa chicken burger ($20). The chicken is baked in a tandoor oven, and it’s tender and tangy, which offsets the sweetness of the sweet brioche bun, nicely toasted for a crusty and fluffy texture, buttered generously. A strength of the restaurant is that there are good dishes from starters to desserts, and this pear tart ($16) is wonderful. It comes with a chilli-lime ice cream which has a merest touch of spiciness, and the ice cream equilibrizes the sweetness of the pear. The tart shell isn’t typical, more like the texture and flavor of buttery croissant. On the whole, this restaurant serves balanced, tasty food without flaws. We liked every dish, and hated none.